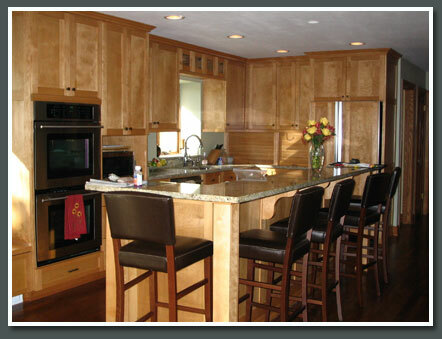 Michael David Cabinetry and Design, LLC is a premier custom cabinetry and wood working contractor located in West Bend, WI. We offer a wide range of services from kitchen and bath remolding as well as custom bookcases, home and commercial offices, entertainment centers, counter tops, home bars, new construction to remodeling and commercial services; we will meet your every need. Over 30 years as a master craftsman and professional business owner, Mike Wolf understands how to meet the needs of his clients. With a dedicated team of experienced craftsman and designers, each capable of performing their duties without supervision and taking pride in their work, Michael David Cabinetry and Design, LLC's exceptional team can and will deliver. Our skills are legendary, with direct client input on the project from the design phase to the fit and finish, Michael David Cabinetry and Design, LLC offers our clients the very best. With many finishes to choose from, and experience working with many types of wood from, Michael David Cabinetry and Design, LLC can provide you with exactly what you desire. Large or small, commercial or residential, simple or ornate… from start to finish we work for you and our work speaks for itself.